Interesting times on the 336ER, Savage 99 358 market these days. Have hunted the 356 for twenty some years, scoped, the 180gr Speer, deer just go down. Used the same bullet in a 358 BLR for the same effect. Do like the Savage 99F, and carried those (300 Sav/30 for a few years loaded hot with a 170gr FP, same drop on shot. What is interesting, to me at least, wanting another powerful lever .35. thought about re-chambering a 30-06 Win 1895 Browning to 35 Whelen. 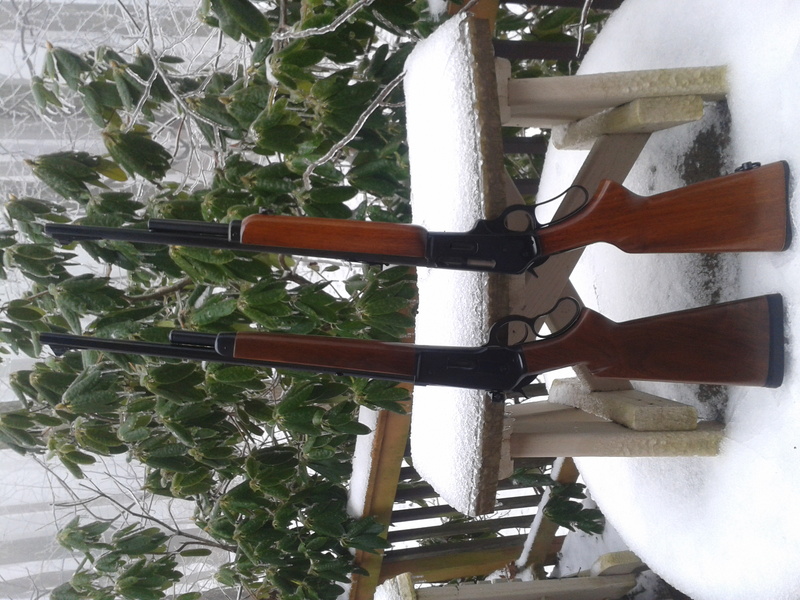 Ended up with a Browning Winchester 71 Carbine .348, as the current price is below a 336ER or Savage 99 358. Did not find getting cases for reloading a problem at all, and not much more than .356 cases. Of course the 71 is no a rifle for scopes, but hunt peeps a lot. Pushing a .348 200gr at near 2450 fps out of the short barrel, it is right their with the 356/358. The Win 71, while not a Marlin is a classic enough rifle, having its own legend. Research indicates that Browning made and equal number of carbine and rifle Winchester 71 reproductions at 3,500 each, making it a rather rare rifle in its own right, and much less expensive than original Winchesters. On the used/NIB market the rifle version (usually in excellent condition) is found in much greater numbers than the carbine, perhaps suggesting the carbines are in actual use to a greater degree. Win 71 on bottom, 336 SC on top, sorry for the crazy pic orientation. Last edited by graymustang; 03-30-2019 at 09:52 AM. Vooch and 94win30wcf like this. 350Rems and they were far from tack drivers. The extra power means nothing in this case. I'm not crazy about 375Win but Im stuck with it as Ohio deer gun. The 35whelen is in a different class and can't really be compared to these others. I had a 35Win for awhile but it had terrible bore and wouldn't group at all. It really wasn't much more than a 35Rem in a powerful looking case. The 38/72 was another Win cartridge for their 1895 that was a flop. The 35Rem hangs in there so they must of got something right. Seems American gun market is fickle on .33 & .35 cal cartridges. The 30cals are American favorites because there is not much in lower 48 that requires more. One thing not mentioned previously is availability of bullets. Hornady has discontinued the 220 and 225gr .375” bullets. I’m quite fond of the 225gr Spitzer in my .375Ruger. Also, Sierra has discontinued their 220gr FN IN .375. This leaves custom and cast bullets, and of course new-old stock... or rare factory ammo. I have both a M336C .35Rem and a BLR in .358win. Per the OP’s original question, the .35Rem is the best “bang for the buck”. A Sierra 200gr RN is a marvelous deer, hog, black-bear bullet. Best, actually since the Remington CorLokt is gone. (Even new factory loads use an impostor). For a bit more penetration, substitute the Hornady 200gr RN. For any reasonable use of the .35, the 220gr Speer works splendid. The only use where the .358win significantly beats the .35Rem, is moose or elk in open country. But, only then with either 225gr Nosler AccuBond or Sierra GameKings. And, of course various 250gr bullets for close in great bears. I lament the loss of the the 200gr .338” Hornady FN. I’ve got three .338’s that could make good use of them. Im not a big fan of the FTX bullets in other than .257” or .338”. graymustang and JACKTW like this. In GOD we trust: all others are "suspects"! Goose, it will be another year until I get around to the 338 bullets for our 338ME's but make no mistake, 33cal bullets are a priority as I need them as well. Yes, I'm launching my bullet biz as soon as our website is done. To say it's turning out to be a challenge would be a gross understatement. But it won't be long I promise. JMAG54, Ret_Eng, graymustang and 2 others like this. Good for you, Jack!! I'd not seen anything, so didn't know this was coming. Got a menu? Jacketed? Swaged Jacketed? Cast? Travlin, JACKTW and bryan alder like this. My first offering will be bonded JSP's specifically designed for the 308ME's. Although, they're well suited for 300SAV, 308WIN, '06 and 300BO. Ask Jay (Ret_Eng) as he's used them in all these rifle platforms. Mainly going to be handcrafted JSP's, RBTHP, RBTSP, and FBFNSP, bonded and cup-core. I'm developing semi-jacketed big bore bullets that will be a tad different. R&D takes time and money but it's a ton of fun. Beats being bored to death sitting around in my retirement. graymustang, bryan alder, shawlerbrook and 3 others like this. My first offering will be bonded JSP's specifically designed for the 308ME's. Although, they're well suited for 300SAV, 308WIN, '06 and 330BO. Ask Jay (Ret_Eng) as he's used them in all these rifle platforms. Wish we could hit the like button more than once! JACKTW, shawlerbrook, Sweetwater and 1 others like this. I read above that the Win Big Bore 375s are stronger than the Marlin Model 375s. Anyone know where a Savage 375 Win stacks up strength wise? Since the 99 Savage was factory chambered in 308 Win and 358 Win, among others, I would think it is a much "stronger" action than a '94 Winchester BB or a 336 Marlin. But wasn’t the XTR also chambered in 307 and 356, basically rimmed 308 and 358? Last edited by KeithNyst; 04-10-2019 at 05:53 PM.